As I step out the door, the entire neighborhood knows, due to the group howl that rings through the air. Led by part Beagle Santana, who’s crated the closest to the back door, it can be quite a noise. Separation distress barking, or howling in the case of our dogs, is them letting us know that they don’t like to be left alone. And it only happens when I leave the house, not Sister or the Man of the House, or anyone else. They become very unhappy when Mama leaves only. 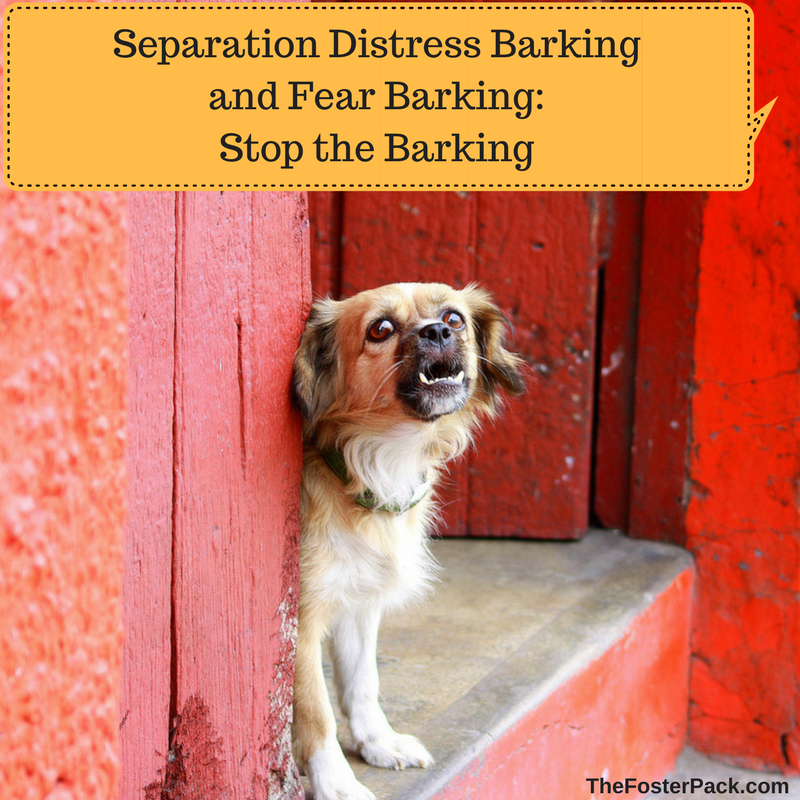 Separation distress barking is a sad bark or howl. It’s not the severely anxious bark of true separation anxiety. It’s much milder and more manageable. At our house, it lasts about a minute after I walk out the door. Then they settle down and relax in their crates until I come back. Or lay down and pout because even if Sister or MOH is home, they want Mama. A comfy crate with a few destruction proof busy toys goes a long way toward stopping separation distress barking. [amazon_textlink asin=’B00P0MK4UO’ text=’Hard rubber toys that dispense treats’ template=’ProductLink’ store=’fosterpack-20′ marketplace=’US’ link_id=’df654a82-8775-11e7-b7ee-253fb8cb1467′], such as stuffed [amazon_textlink asin=’B0002AR0I8′ text=’Kong’ template=’ProductLink’ store=’fosterpack-20′ marketplace=’US’ link_id=’e8c3aa4e-8775-11e7-bcc7-25037c221dcb’] toys, or a [amazon_textlink asin=’B00201JENG’ text=’Nylabone’ template=’ProductLink’ store=’fosterpack-20′ marketplace=’US’ link_id=’fa795b27-8775-11e7-8532-3b9bddda5673′] spread with coconut oil, to help clean their teeth too, are great boredom busters for dogs when they have to be left home alone. Soothing [amazon_textlink asin=’B00CJD72EI’ text=’lavender essential oil’ template=’ProductLink’ store=’fosterpack-20′ marketplace=’US’ link_id=’0eed41e8-8776-11e7-bcc7-25037c221dcb’] in a diffuser near the dogs is said to help too. Lavender really does help with anxious dogs. There are also special [amazon_textlink asin=’B000O5HUEA’ text=’pheromone based diffusers’ template=’ProductLink’ store=’fosterpack-20′ marketplace=’US’ link_id=’2a33600b-8776-11e7-bc68-1114083bc624′] that claim to have calming benefits for stressed out dogs, without resorting to medication. Which is rarely need with just separation distress barking. A Quiet command can also be helpful with all types of barking dogs. And as always, a tired dog is a good dog. Make sure Rover has had enough exercise before leaving him home alone. Fear based barking often goes along with fear based aggression in dogs. Conquering the fear is the best way to help stop the fear based barking. Using a desensitization and counterconditioning program goes a long way towards helping your dog to conquer his fears. And patience. Patience is always needed when working with a fearful dog. Great and useful post a dog owner.Thanks for sharing! Whenever I leave the house, I make sure to leave something to keep my Frenchie busy. Another tip that I must add is to leave the TV on so they don’t feel so alone. Patience is the key when it comes to anything related to training your dog!